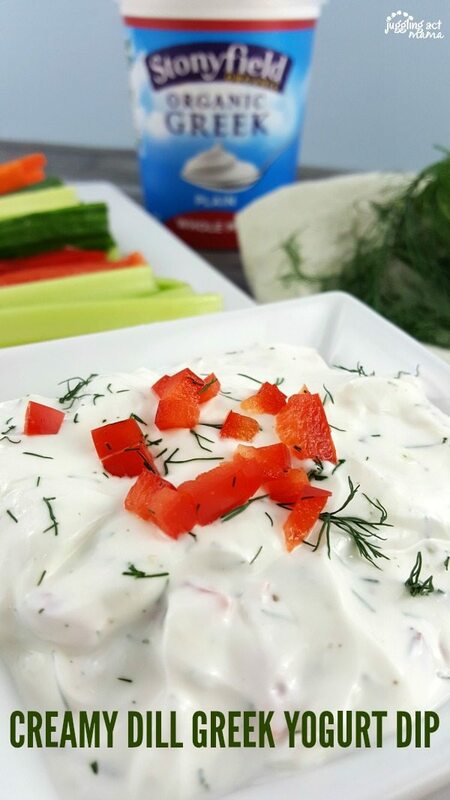 Your friends and family will love this Creamy Dill Greek Yogurt Dip. Being a PTA mom is hard. I know I’m not supposed to complain since I volunteered for PTA, but sometimes it’s just a lot of work. Thank goodness our PTA has tons of great volunteers, so I have lots of support. During April vacation, I invited a few of the ladies over to give me a hand preparing for teacher appreciation week. We put together fun gifts for our staff, sipped wine slushies, and munched on some tasty nibbles, including this Creamy Dill Greek Yogurt Dip. While our tasks would have been tedious to do alone, together we were done in a flash and had a good time, too. I feel blessed to have found other moms that want to make a difference in our school. 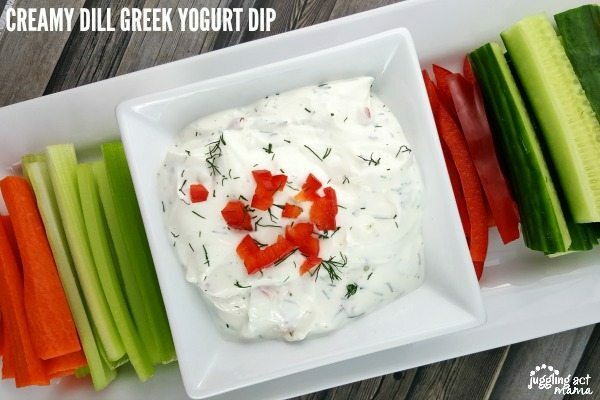 This Greek yogurt dip is perfect for parties and gatherings. It’s super creamy from the Greek Yogurt, which pairs really well with the anise-like flavor of the dill. This recipe is healthier than a dip made with sour cream, and the dill has it’s own health benefits, too. Did you know that dill is a good source of minerals like copper, potassium, calcium, manganese, iron, and magnesium? I didn’t until now, and I have to cook with it more! What’s the Different Between Regular and Greek Yogurt? If you’re unfamiliar with Greek yogurt, it’s more tangy than regular yogurt, and has no sweetness. The Greek version has almost twice as much protein and regular, but also has about three times as much saturated fat. Greek yogurt has less sodium and carbs that the regular version, as well. I use Stonyfield yogurt products because they are local to me. Their products have great flavor and (I know this sounds silly) I love their business model. Stonyfield is all about doing the right things, the right way. There are no toxic persistent pesticides, artificial hormones, antibiotics or GMOs lingering around the ingredients. Stonyfield has several versions of Greek yogurt from full fat to none. For this dip, like most of my recipes, I like a nice balance and use my own blend of half Whole Milk and half 0% Fat Greek Yogurt. If you’re not a fan of Greek yogurt, you could also use plain yogurt in this recipe. Either way, using yogurt to make a veggie dip is just smart! 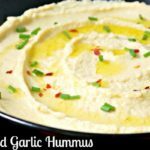 It’s much healthier than dips that start with mayonnaise or sour cream. And, the best part is, dips made with yogurt still taste really great, too. 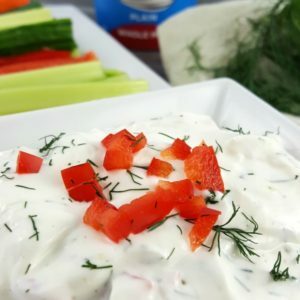 Creamy delicious dip made with Greek yogurt and fresh dill is both simple and delicious. Mix together the Greek yogurt with the red pepper, dill and garlic. Season with salt and pepper to taste. Garnish with more fresh dill and red pepper. Chill for one hour before serving along with crudites. Serves 4-6 people. For a large group, you will want to double the recipe. To make a salad dressing, add 2-3 tablespoons of milk to the recipe and mix well to combine. Tarragon: For a delicious variation, substitute fresh tarragon for the fresh dill. Tarragon also pairs well with Greek yogurt because it gives a distinct flavor that stands up to the yogurt and is especially yummy with fresh vegetables. Tzatziki: Play up the Greek in this dip by making a Tzatiki version. Coarsely grate a medium sized cucumber and fold it along with a tablespoon of fresh lemon juice into the dip mixture. Crudités can also sometimes include other items like olives or crackers and one or more kinds of dip. PRO TIP: For a successful party, set out small plates guest can use to pile up their nibbles. Be sure to provide a spoon for the dips, so that people can scoop a little onto their plate. How Can I Use Greek Yogurt in Other Recipes? Substitute Yogurt instead of sour cream 1:1. So if your recipe calls for 1 cup of sour cream, just replace it with 1 cup of Greek or Plain Yogurt instead. For a mayonnaise, the best result is to substitute part of the mayo with Greek yogurt. If your recipe calls for 1 cup mayo, reduce it to 1/3 cup, and use 2/3 cup of Greek yogurt instead. Ricotta can be halved and the other half replaced with Greek Yogurt. This is also true of heavy cream. I’m on the Board of Directors for our HOA which I volunteered for as well and sometimes complain because it’s a lot of work. ;D So I hear ya! 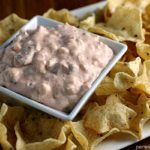 This dip looks awesome!